The largest music and Halloween-themed experience in the Southeast region returns to Miami for its third turn in 2018. 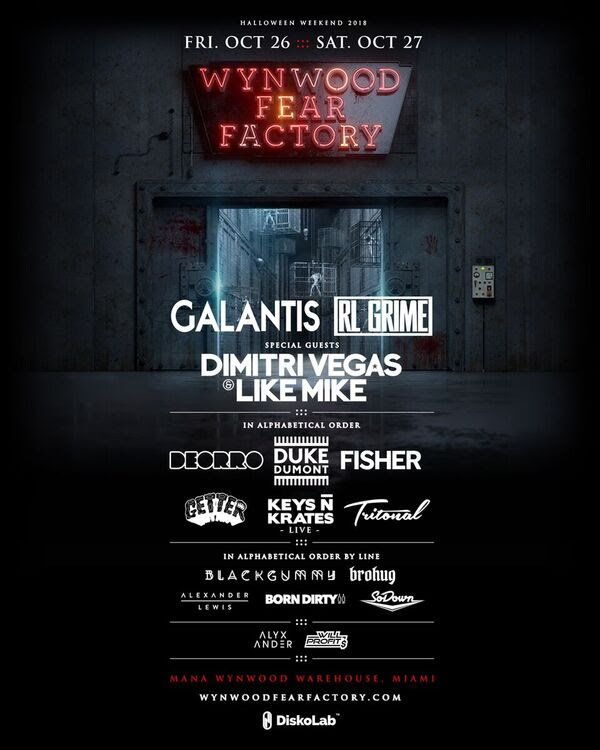 Presented by Diskolab,WYNWOOD FEAR FACTORY is set for Friday, October 26 and Saturday, October 27. The two-day event takes place at Miami’s premier event venue, Mana Wynwood Warehouse. At its new indoor location, the experience is suited to host the best production for the A-list lineup, including,Galantis, RL Grime, Dimitri Vegas & Like Mike, Duke Dumont, Deorro,Fisher, Getter, Keys N Krates (Live), Tritonal, Brohug, Blackgummy,Alexander Lewis and more. Check out the full confirmed lineup below. WYNWOOD FEAR FACTORY was a wildly popular event when it debuted in 2016 and has served as a must-attend Halloween event the past two years.Now in its third year, WFF has quickly grown into South Florida’s must-attend Halloween Weekend experience. The third chapter will be a two-day event at the Mana Wynwood Warehouse, located in Miami’s Wynwood Art District–the trendiest neighborhood in the city showcasing art galleries,restaurants/nightlife spots and some of the best street art on the planet.In 2018 the experience has shifted to Friday & Saturday with later start & finish times of 8:00 pm to 3:00 am, giving patrons more accessibility to enjoyone of the biggest fun-filled weekends of the year. Saturday, October 27 – RL Grime, Duke Dumont, Fisher, Keys N Krates (live), Brohug, Alexander Lewis, Born Dirty, Will Profit, Lyon.